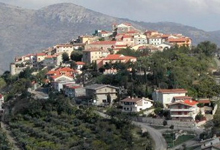 ITRI is the town where our farm is located: a small town 170 m above sea level, nestled in a gentle valley between the foothills of the AURUNCI MOUNTAINS. It was built by the Romans as a post house on the Roman Via Appia, the ancient REGINA VIARUM, still preserving the old route, with its pavements, climbing up a gorge in the mountains; you can still see the remains of the premises used as a shelter for travelers and for horses, a TEMPLE of APOLLO and a SMALL FORT built by the BOURBON KINGS. In Medieval times, ITRI sees the expansion of its town towards the hill, from where it was easier to defend itself from attacks of invaders. 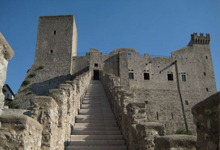 To this end, in the ninth century, a FORTRESS was built by Docibile I. The fortress was later expanded to become a MAJESTIC MANOR that, from the top of the hill, with its TOWERS and PASSAGES, descended to the valley up to incorporate the whole OLD TOWN, a quaint maze of alleys, stairs, squares and historic residences. ITRI is completely immersed in the NATURAL PARK AREA of MONTI AURUNCI: inside there are low and medium difficulty nature trails, for hiking enthusiasts, equipped areas for picnics and the ancient Sanctuary of the Madonna of the Civita, the patron saint of Itri. The SANCTUARY is a PILGRIMAGE destination, since POPE JOHN PAUL II has visited it and thanks to an impressive collection of EX-VOTO OFFERS. MANDRARITA FARMHOUSE is located halfway between ITRI and SPERLONGA, just down the road that, from the rolling hills covered with GROVES, CORK TREES and THE MEDITERRANEAN BUSH, reaches the SEA. The road leads directly to SPERLONGA: an ancient fishing village made of fishermen's houses, typical squares and stairways, that has become the most famous seaside resort of RIVIERA di ULISSE. 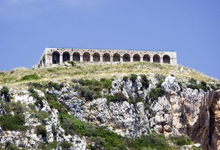 From the center of the village you can admire breathtaking views of the beaches below, on the MOUNT Circeo, the PONTINE ISLANDS and VILLA TIBERIO with its MUSEUM. 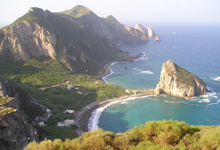 The whole coast is known as the “RIVIERA di ULISSE”, because it was here, between GAETA, SPERLONGA and SAN FELICE CIRCEO, that Ulysses landed during his journey and where he met CIRCE and PRINCESS NAUSICAA. Here Roman EMPEROR TIBERIUS built his most sumptuous VILLA, which incorporated a FISH FARM, built in a sea cave, known as the GROTTO of TIBERIUS. The coast shows a series of BEACHES and COVES, some of them accessible only by sea: Bazzano with The Roccia dei Falchi, Torre Capovento, Punta Cetarola, The Grotta dell'Arenauta, Torre Scissura, Ariana, Fontania, Serapo, the Porticciolo Romano di Gianola, Monte d’Oro, Monte d’Argento, the Spiaggia dei Sassolini. The town, built along the Via Appia in Roman times, is characterised by the imposing Temple of Jupiter Anxur, overlooking, from the top of the hill, the breathtaking views of the Riviera di Ulisse and the Pontine Islands. The Old Town, upstream, is the result of a combination of the imperial era and the Middle Ages: here you will see the Roman Theatre, the Foro Emiliano, and some remains of the old Roman Appia, but also the Cathedral, the Palazzo Venditti, the Bishop's Palace and the Torre Frumentaria. Downstream, the modern town, in direct contact with the sea that bathes the long beach of fine sand, with the shopping streets and beautiful buildings dating back to the twentieth century. Continuing southwards, moving a little away from the coast, the road leads from Terracina to Fondi and. Once passed the ancient border between the Papal State and the Kingdom of the Two Sicilies, you will find the mountain, with the beautiful and well-preserved Sughereta, and the Lake of Fondi: a green oasis full of reeds where the fauna of the lake, that can be admired from characteristic small boats, from which you can also watch bird migrations, finds refuge. Fondi is an ancient town, as evidenced by the robust Cyclopean walls, but it was in Roman times that it reached its splendor. The town reflects the architectural design typical of Roman towns, and it houses the remains of the "opus reticulatum", the Temple of Jupiter, on which the Medieval and Renaissance palaces and the Castle, with the Keep and crenellated walls, were erected. 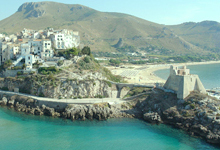 Going south, Gaeta is the town that you meet immediately after Sperlonga. It is situated on a slope of the Aurunci Mountains, that here meet the sea to form, in fact, the Gulf of Gaeta. 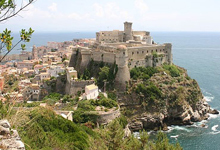 Gaeta is a very old town, a Maritime Republic and the last bastion of the Bourbon monarchy. Its port was very important in Roman times (hence ships left loaded with the delicacies produced in the territory: extra virgin olive oil transported in the typical "Amphorae", sweet pickled olives, later called, indeed, Gaeta olives), while the remains of the Mausoleum of Plancus, on the top of Mount Orlando, are still visible. Today it is a Regional Park, thanks to its location, its natural beauty and the presence of an unusual crack in the mountains overlooking the sea: the Montagna Spaccata with the Sanctuary of the Trinity. The heart of the medieval town is built around the Angevin-Aragonese Castle, a gigantic military building dating back to the tenth century; descending from the top of the village, through narrow streets and staircases, you arrive at the Cathedral , which dates back to the eleventh century, the Crypt and the relics of the patron saint and the historiated Campanile. 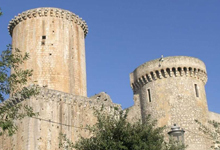 Being the seat of the Archbishop, Gaeta boasts many important buildings: the Diocesan Museum, the Bishop's Palace, Palazzo De Vio and many churches. The Borgo Marinaro is fascinating at sunset, when fishing boats come back, when the lamps are lit, and boxes of freshly caught fish are offered for sale. On top of a hill, 647 meters high, it can be reached through a road immersed in the woods, at the contact point between Ausoni and Aurunci mountains. It is known for the longevity of its population, supported by statistics, thanks to its good air, the absence of traffic and the Mediterranean diet. The town center has a pyramidal shape, internally connected by small staircases that still preserve the charm of the past. 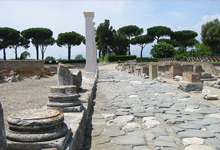 Continuing along the Via Appia, to the south, passing the Porticciolo Romano di Gianola, the promontory of Monte d'Oro, you get to the Archaeological Area of Minturnae. Here you can admire: the Roman theater, dating back to the first century BC, the Republican Forum, the Capitol, the old Via Appia in basalt, the Antiquarian, still in excellent conditions. In the medieval center of Minturno, you can not miss The Baronial Castle dating from the eleventh century and the Church of St. Peter. Not far from the archaeological site, you can not miss the Bourbon Bridge on the Garigliano river: the suspended bridge, over the Garigliano, supported by iron chains, which is unique in its kind, was built by King Ferdinand of Bourbon in 1832 to reach, from Naples, the Angevin-Aragonese Castle of Gaeta. 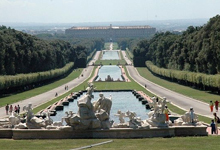 The Old town of Caserta and the Royal Palace with its gardens and fountains, comparable in splendor only to the Palace of Versailles, are definitely worth visiting. Inside the territory is rich in countless Cistercian Abbeys. 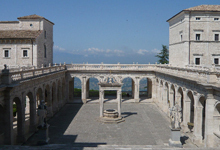 Starting with the closest: the Abbey of Montecassino, erected by St. Benedict in 529 on top of the mountain, on the remains of an ancient pagan temple. It was an active religious and cultural center, home to a rich library of illuminated books and precious codes. It was almost completely destroyed during the Second World War; the Polish, German and English war cemeteries are evidence of the ferocity of the battles. Valvisciolo Abbey, Trisulti Abbey, Casamari Abbey, Fossanova Abbey... are all typical examples of Cistercian architecture. 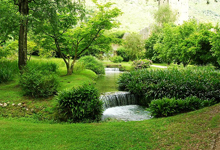 The Garden of Ninfa deserves a special mention. Ninfa was a thriving town ultil 1200, then the malaria outbreak forced the population to abandon the town. Later, the Caetani family had the town rebuilt. Among the ruins of the medieval town, you can admire a beautiful garden: exceptionally beautiful plants, rare and endangered species in the different seasons of the year that offer spectacular blooms, but also rivers and lakes and the remains of churches and homes. The dense vegetation covered most of the buildings with its tentacles and the final effect is truly magical. 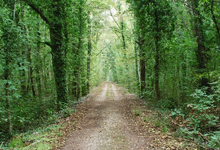 A rare example of plain forest, the park includes a promontory, an island, over 20 miles of dunes, four coastal lakes, more than 3000 hectares of forest, hundreds of animal and plant species, old houses of straw, the Domitian Villa and the Borgo di Fogliano, as well as walking or cycling nature trails. While Sabaudia, a pure example of rationalist architecture, and San Felice Circeo, are famous seaside resorts. 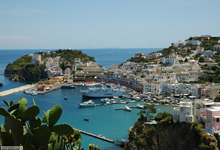 PONZA is the largest island: from the port, it looks like a harmonious puzzle of fishermen's cottages with soft colours, contrasting with the blue sea. 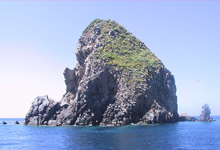 Ponza is all about the sea: its seabed is rich in archaeological and natural remains attracting diving tourism. Its fish is the most valuable of the Tyrrhenian Sea. The popular Peschiera Romana, dating back to the first century A.D., is decorated with marble and statues belonging to the reign of Augustus. It can be reached in a short time, leaving from the marinas of FORMIA and TERRACINA. 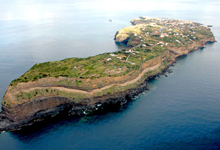 VENTOTENE, with its unspoiled nature, is a natural oasis for species of migratory birds that stop here to rest. Away from the hectic traffic of modern cities, here you can walk to reach small coves or to enjoy the natural flora of the island. PALMAROLA has a volcanic origin and is characterised by its vitreous rock, including obsidian, where the inhabitants have dug dozens of caves. Leaving from the marinas of FORMIA and TERRACINA, you can reach the Pontine Islands in a short time, crossing the sea while enjoying a unique view of both the coast, from which you depart, and the islands that you are about to reach. ZANNONE is part of the National Park of Circeo and is covered by a forest of holm oak and by Mediterranean vegetation, where mouflons, and all the birds that here stop to rest during migrations, live undisturbed. SANTO STEFANO is an uninhabited island where the Bourbon prison, active until 1965 and a unique example of prison construction dating back to 1700, was built.